Maximum size: 1.8 mm shell length. 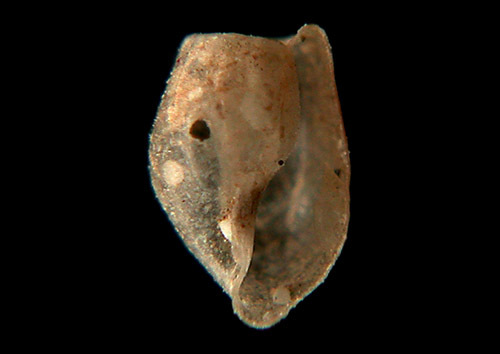 Identification: The shell of this species is similar to the shell of Colinatys sp. #1 in form but is translucent-amber without white reticulations. Natural history: Diaphana(?) sp. #2 is known from one worn shell found in a sand sample from 60 m (196 ft). Taxonomic notes: First recorded in Hawaii off Makena, Maui by CP from a sand sample provided by Mike Severns and PF on Dec. 3, 1991. Although its shell resembles shells of known species of the genus Diaphana, there's some question about its identity due to size and wear. Photo: CP: 1.8 mm: from sand sample provided by Mike Severns and PF; off Makena; Dec. 3, 1991.